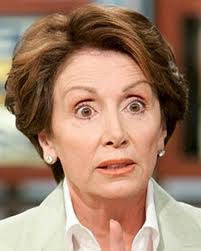 This is the same Nancy Pelosi that wants the Boeing plant in a right-to-work state to unionize or shut down, right? At this point in time, considering some of the ridiculous and stupid things Nazi Pelousy has said, I think it's a given that she's not playing with a full deck. And trying to prove a "negative" as in the stupid statement that "we'd be at fifteen percent as opposed to nine percent unemployment because of Omama's wonderful stimulus" is a mathematical impossibility.